In large bowl, mix snack mix, cereal and candies. Spread out on large round serving platter. In small microwavable bowl, microwave white baking chips uncovered on Medium (50%) 60 seconds; stir. Continue heating in 15-second increments, stirring after each, until stirred smooth and melted. Transfer to small resealable food-storage plastic bag. 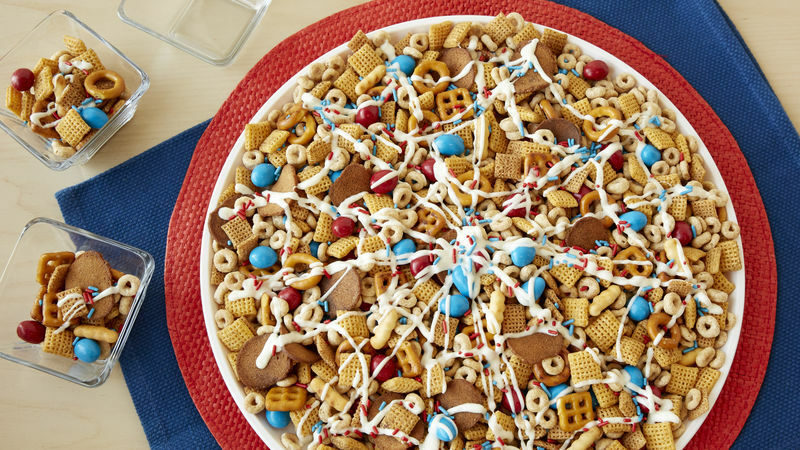 Cut small corner from bag, and squeeze onto snack mix to look like spider web; top with candy sprinkles. Let stand 20 to 30 minutes or until set before serving. Your favorite variety of candy-coated chocolate candies may be substituted for the candy-coated chocolate peanut candies. Store snack mix in covered container.